Is anyone else getting a red warning indication saying "dangerous downloads" under their site listing in Yahoo? Yahoo is the only place I encounter this, but everything checks out fine if the site is tested for a virus. McAfee (who has partnered with Yahoo) is doing this and cites synthasite.com as the problem itself. I have contacted McAfee (who stated that I must use there product to get it removed), ATT and Yahoo, as well, but no answers that explain the problem. I have contacted Yola on this, but await a return. I should mention that synthasite is cited for the problem (which says there is no problem) when one clicks on the "details" link in the red warning indication. I think your problem is that you have a couple of widgets on your site causing this...I looked at your site on McAfee SiteAdvisor and took a screen shot. I am about to leave for a little bit but I will help you out when I return.....I can get the file names for you....chances are they are in a widget and you had no way to know it...At least McAfee is not listing them as dangerous. Hey they even put that warning on the listing for Yola.com link to their sign up for services page. Looks like they would like to eliminate all the competition. Just go to their search engine and type in yola.com and see all the sites they have black listed. You know a lot of people came to yola after they closed Geocities....they must really be hacked off!!! OBTW I found this link in a google webmasters group. http://www.unmaskparasites.com/ I put my yola address into it and it comes up clear. It also shows google's result and it was clear as well!! Just goes to show you how low Yahoo won't go. Don't expect them to fix it soon, because it is not in their financial interest to do so! They will just keep passing it off on McAffee ---the junk that I took off my computer because it was so dysfunctional. I use Avast, something that works at least. This has been my opinion. I just tried the google webmasters site you listed--my sites made with syntasite are fine. I am perplexed, but another poster here is going to try to help. Yahoo gave me quite a runaround with this problem, and I could not believe what McAfee suggested I do--just buy their product and all will be well. That is crazy. I use AVG and have had no problems. It lets me know if there are problems in downloads or sites. Why, one has to ask. it is necessary for Yahoo to have to partner with another company in order to assist in virus protection? That should be a consumer choice and the consumer should always be careful what they are downloading anyway. It seems to be becoming a little over the top. If the situation is not resolved someway, it is useless to attempt to have a site if there are red warnings under the listing. This is only happening on Yahoo, but there is a principal involved here. Where do did you see this? On a Yahoo search? I did not see it come up. I have only seen it under my own sites, no where else. Another mystery. You can't fight a big corporation and win and they know it. I will tell you one thing I would never buy a website space from them, they are in my opinion, a poor and incompetent hosting company and have been since geocities. You know one of the people that I webmastered for wanted to stay on their service when they closed geocities. They said they would make the transition easy. All we had to do is wait until the day after they were to lose and choose a new URL. Guess what they put a code on the old page that REMOVED it from all the search engines!! Had to register the new site all over again and it started from about page 20 in rankings (from page 1 and page 2 page rank), none of the page rank was transferred because of what they did. Does that sound like an incompetent service provider to you? This has been my opinion. I think this is something Yola engineers would need to look at since others are having this same problem.I am not getting this on my domain so I am thinking it is something on the free sub domains. You are not getting it yet because the bot hasn't visited your website yet. Just like when you type in a yolasite.com yahoo search you will see that some of the free listing are not YET flagged either, but just wait......when the bot visits!!! I bet you that 99% of the people here don't even know what is goin on with Yahooo YET! I don't know how to contact any one here in this company, hope that you do! Anyway? Is it one of those links, like yahoo-geocities use to place on their pages for advertisments? Admittedly, the files are Greek to me, as well as the behaviors and all other webmaster lingo, but I learn a great deal from any problems that crop up from time to time. This current one has a great deal of questions that both Yahoo and McAfee should have answered, but could not seem to find the words. The Yola engineers will be getting back with me on this soon. Thanks to both of you for assisting me. I wondered about my sites being free, that that may be the problem. I plan on upgrading the newest one. The ball is in Yola's court. Thanks for making us aware of this. We'll be investigating into this to determine why this is happening. As it is the weekend, we most likely need to wait until the start of the business week to get an update on this. Thanks for your patience as we delve into this mystery! web4yar2.synthasite.com is not your site, of course, but Yahoo is treating all synthasite.com subdomains as the same. This is why your site (and all of our other subdomains) are being treated as suspicious by Yahoo: one of the subdomains has some files which Yahoo is not sure about. We're sorry about this inconvenience, and we are going to try to contact Yahoo to get them to stop blanket-punishing all of our users' sites because they think one of them might be suspicious. In the meantime, don't worry too much - your site isn't infected with any viruses. Thank you. Mr. Hitchcock. This makes sense, as McAfee is sending me emails that are citing files and sites that are not mine, but are made by Yola. I think that this confusion is going to keep happening as long as Yahoo tends to not want to take responsibility. I have to even question why a partnership was necessary in the first place--such a situation seems to point only to trouble, as McAfee is not the ONLY virus protection provider out there. Thank to all for the help here. YAHOO! is the problem. They are putting this message on every yola website: Warning: Dangerous Downloads Just go to their search engine and type in the term: yolasite.com and see for yourself. They even put the warning up for YOLA site's main page link itself!!!! My opinion is that they are pissed because when they closed geocities, a lot of people migrated to yola instead of giving in to their forced migration to their paid site with their outrageous charges. So they are trying to shut down the competiton. That is my opinion. Anyone else having problems with Yahoo? Yahoo's Warning: Dangerous Downloads posted on Yola and Yola websites. I sent Yahoo an email as my site was being flagged and this is the reply i got. Thank you for writing to Yahoo! Search Webmaster. 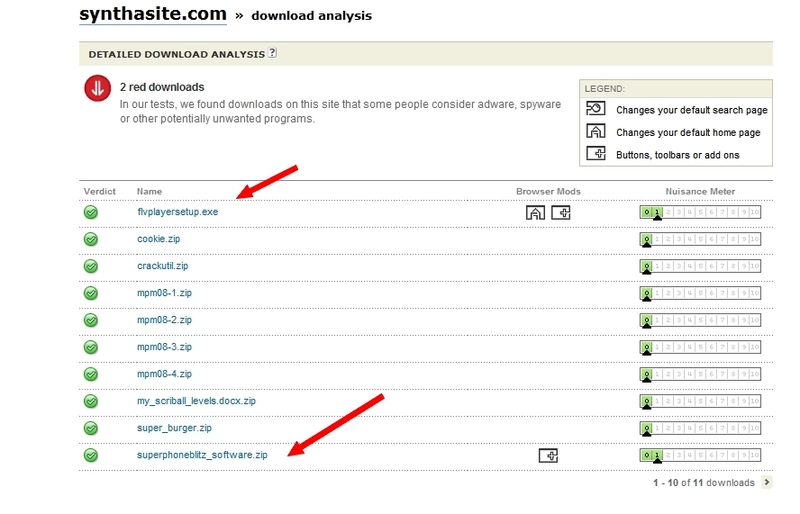 I understand that you have concerns about the Dangerous Downloads warning on your site. Yahoo! SearchScan is powered by McAfee. McAfee provides safety data within Yahoo! Search results to indicate potentially harmful websites. McAfee will then analyze your domain over a period of several weeks to determine if the warning is valid. We appreciate your patience during this process. Please understand that Yahoo! does not have the ability to change a McAfee decision on a site's rating. We apologize for any inconvenience this may cause. Thank you again for contacting Yahoo! Search Webmaster. Thanks John! We will email McAfee about this and see if they can help us. I just received an email from McAfee saying that the red warnings should be gone across the board now. Please comment here if you're still seeing a warning in Yahoo so we can follow up with them. Thank you all for your patience!! As far as I can tell, there is no more red to be seen. It seems the problem has been solved. Thanks Yola for your untiring efforts and from others who contacted those who need to be contacted--It was a lot of work on my part as well, but that is how it gets done. I feel more confident and am going to finally buy my Yola domain name. We posted a blog post on our blog on this issue. Concerning Yahoo Search results, McAfee Antivirus, and their partnership the Yahoo Search Scan Beta program. Take a look what happened to us! More news from Yahoo, Yahoo Search Scan Beta, and nothing yet from that glitch-ridden McAfee Antivirus Company. Thank you for writing to Yahoo! Search. Before I go into addressing your concern, I'd like to apologize for the delay in my responding to your inquiry. We are committed to answering your questions as quickly and accurately as possible. However, we are currently receiving unusually high volumes which caused the delayed response. I'm sorry to hear that our last email was not helpful. and click "Russian women, Belarus women Marriage-Belarus Bride Too". Before being allowed to proceed to the site, you will then see a dialogue box that reads "Careful!". As previously stated, we do not have the power to change Bing's warnings and so you will need to contact them to have them re-evaluate your site. This may not be the most satisfying answer to the concerns you have, and if so, I apologize for that. If I can help you with other concerns or issues, please don't hesitate to reply to this email and I will gladly assist you further. Thank you again for contacting Yahoo! Search. Thank you for your response to our letter. Your response is appreciated, but once again is not helpful. Our site contains no harmful downloads or viruses. We have the green light from Norton Antivirus, as it appears on all the search engines including Yahoo. We have once again checked our listing on Bing, from your link, and again Bing search results show no warnings about our site. The problem is the Yahoo Search Scan Beta program, which is the Yahoo partnership with McAfee Antivirus. As you know, many small businesses have been effected by the "glitch" in your Yahoo Search Scan Beta program which falsely adds a "Warning Dangerous Downloads" search result on many business listings on Yahoo Search. We get the impression from Yahoo that you people have no control over what Yahoo Search publishes, and we understand that since Yahoo is really only an arm of Bing. The problem we have, as you probably understand, is the fact that Yahoo Search is still showing that warning on our Yahoo Search results, for no reason at all except for the "glitch" with your Yahoo Search Scan Beta. Bing Search shows no such warning, so we see no point in writing to Bing. We have written Yahoo and McAfee Antivirus on this issue, McAfee hasn't replied at all. At least you have answered our letter. We will publish this correspondence in hopes of forcing a resolution from Yahoo and McAfee Antivirus. Thank you Fiona for your assistance with this!